Zimbabwenomics is mainly a field of economic study, but that doesn’t meant its guiding principles can’t be pragmatically applied to create solutions for any problem (note: if there is no problem, Zimbabwenomics can utilized in creating one). Robert Mugabe was facing a difficult re-election as president of Zimbabwe in the elections earlier this year, one that had seen tension, vitriol and internecine tribal conflict on a scale almost matching that of the US Democratic Primaries. But Mugabe understood a fundamental concept that his opposition and international haters failed to grasp, namely the inherent advantageous position that a Zimbabwenomic analysis of his candidacy revealed. Recommendation: Readers familiar with Zimbabwenomics knew from the outset of the elections that Mugabe retaining his position was a fait d’accompli. Long the Pullout Method of Dictatorship Retention. Make it a pair trade – short the Pullout Method of Pregnancy Prevention. Why would we short something that not only works well, but that we use in our day to day life? Between the PO and rhythm methods, I have been free from child support for 30 years. 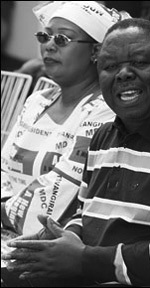 Mugabe’s opponent’s wife’s shirt is nothing. I have this spectacular shirt from Gabon, the fabric of which shows the Nation’s flag, the president’s face, his name and political slogan. It is so ugly that it is in fact beautiful. It puts the relatively understated Obama shirts I see to shame. I dunno I use citigroup in my day to day life and have been massively short citigroup the last two year and have noticed no ill effects other than those brought on by using citigroup in my day to day life. Why should I care what happens in these crap countries? Agreed … long dope countries, short crap countries. “I was in Zimbabwe last May. Whilst there I bought a Chinese take-away for 3 people. It cost me a million bucks. About £8 at the time. When ##### was in the UK two weeks ago, he gave me a $50,000,000 bill, valued at the time at £0.10! “Written of the face of that bill is the following. “Fifty Million Dollars on or before 30th June 2008 for the Reserve Bank of Zimbabwe. Issue date 2nd April 2008. BEARER CHEQUE.